At the packed premiere of her film in Toronto, debutante director Kiran Rao had a disclaimer for the audience: both about the film - "it is not a song and dance film" - and on one of her lead actors - "This isn't the usual film you see my husband in." As if on cue, one of India's most successful actors, Aamir Khan, strode to wife's side at the screening of her eagerly awaited film, 'Dhobi Ghat'. Khan may be used to hogging the limelight as the popular star but at the recently-concluded Toronto International Film Festival (TIFF), he was definitely cast in the supporting role as his director-wife received critical acclaim for her maiden cinematic venture. 'Dhobi Ghat' may be hitting the screens in India only next February, but for those whose curiosity cannot be curtailed till then here's a sneak preview. Set in Mumbai, the film takes viewers through the intersecting lives of four principal characters: An Indo-American investment banker (Monica Dogra as Shai), a brooding painter (Aamir Khan as Arun), a 'dhobi' (washerman, Prateik Babbar aka Munna), and a young bride (Kirti Malhotra as Yasmin). Drawn from different classes, these characters represent a microcosm of the city that welcomes people from all over the country and hence, by extension, houses many cities within itself. With the monsoon as its backdrop, the film casts a loving glance at Mumbai, a cinematic love letter of sorts, and the director admits as much. "The city was the inspiration for the film. I wrote the film trying to portray the city in as many ways as possible. So it was not going to be a straight line narrative but a collage of different people's perspectives," she says. 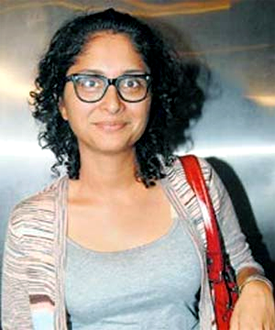 Rao's repeated assertion that "it is not just an Aamir Khan film" is true to a large extent as she ensures that in her collage, each character is well etched out. Khan happens to be just one part of the larger picture: A narrative that is inclusive of different experiences and vignettes of Rao's own journey - of arriving in Mumbai 15 years ago, working there and then going on to call it her home - have wound their way into the film. "I wanted to explore the city through different worlds, the different Mumbais that live in the city so that each of us knows a different city almost," she elaborates. And Rao manages to expertly convey the parallel lives of the characters, who stride into each other's spaces and even inhabit it briefly - like Shai, for example, when photographing Munna at his work and socialising with him - before retreating to their own "city". This raises the question of whether a (romantic) relationship is ever possible between inhabitants of these different cities. And here Rao takes on commercial cinema's long-standing formula: That love can overcome any hurdle. She says, "Commercial cinema has long peddled the idea that love is possible between castes and classes and that love conquers everything. The idea was to see that, if put to test, how far two people from different classes can go with a relationship." In 'Dhobi Ghat' they don't, but the heartbreak does not entail a total loss. As Sarah McCarthy, director of the documentary 'Sound of Mumbai', a musical that was also screened at TIFF, who "loved" the film, puts it, "What really packed emotional punch for me was the end. When Munna realises he is never going to have her he does not wallow in self-pity. So, even if circumstances are really bad, you make the best of it. And even Shai, despite her own loss, wipes her tears and carries on." With the story riding on characters, casting was quite "a process" says Rao. She started off wanting to work with "non-actors" whom she could "model" into her characters. So the search was for real people who would naturally fit their parts. Kriti (a costume designer) and Monica Dogra (a singer) came on board after a test. She zeroed in on Prateik on a hunch after spotting him at the screening of 'Jaane Tu Ya Jaane Na' (an Aamir Khan-Kiran Rao production). "His first test was incredible, had the exact kind of casualness, the aliveness of Munna. Even though I was very keen on someone from that class who works with his hands and has the body language of someone who does manual labour, we figured that we just had to beat Prateik into the body language we need," she says. Incidentally, the in-house talent, Aamir, was nowhere on Rao's casting radar. She wanted to "cast someone who was not famous." But after several tests proved unproductive, Aamir offered to play Arun. But he landed the role only after a screen test. The actor, who started off wishing his wife would never finish the script ("my fear was: 'what if I don't like script? She is going to feel bad'") was bowled over when he heard it. "I was just fascinated by what she had written. It was the best script I have read, so delicate and beautiful. The characters are so well written...they speak in such a different and unique voice. I said 'wow' I am married to a really talented woman," said Khan at the Toronto do. Asked how it felt to be directed by his wife, he quipped, "at home", before adding on a serious vein, "not only as a writer but even as a director she is hugely talented. Like the actors here, she is another very important addition to the creative talent in India and to Indian cinema. And I am really proud of her." On her experience of directing a veteran like Khan, along with the newcomers, Rao says, although they did not have the experience Aamir has, "they are very natural and responsive. I just had to guide them along but then they were also cast because they were just so right." Working with Aamir, she added, "was fun and collaborative. As a character he has so much silence. It was internalised acting and that was fun to explore." Raised in Calcutta, Rao graduated from a Mumbai college and then studied film in Delhi. She has worked as Assistant Director in many films, including 'Lagaan' and 'Monsoon Wedding', and cites Hong Kong filmmaker Wong Kar-wai and Taiwanese director Tsai Ming-liang's 'Vive L'Amour' as her influences. Rao doesn't look at her work through the gender lens and maintains she is a filmmaker who happens to be a woman. "I haven't been conscious of my gender ever since I started working. As a creative person I want to make films that say something about me as a person. I was not thinking of how hard it is for me to get it out there because I was a woman or not. I have had it easier I am sure than many women or men have had it." Easy or not, for now it's time for Rao to enjoy the praise that is being heaped on her. According to TIFF's co-director Cameron Bailey, "she is a super talented filmmaker" and he has no doubt that 'Dhobi Ghat' (alternatively titled 'Mumbai Diaries' for the English-speaking audience) "will work on the international stage." interesting any one, out of five, worthy of becoming a Movie. like you Ms. Rao. Many thanks. Please do reply. Creativity thy name is Kiran Rao.She is so simple, non-filmi and without doubt an intelligent woman.We need more such people in Bollywood.The only problem is that 'Dhobi Ghat' may appeal only to a select audience.The earlier "art films" in Bollywood have now been rechristened as "film for the multiplex crowd". Coming to Mumbai, I agree that no other city in India can match Mumbai's energy and resilience.It is a delight that Kiran has chosen Mumbai as the backdrop for her movie. For sometime we have been missing Hrishikesh Mukherjee and Basu Chatterjee. Thanks to people like Kiran Rao and Rajat Kapoor , we do get to see similar movies.